MARGIT SZENTKIRALYI “Margo” age 85. Beloved wife of Arpad and the late Steve Pecho; dear mother of the late Clare Pinto of Boston, MA, Elizabeth Masterson and Steve Pecho of Rosemont, MN; grandmother of Jon and Michael Masterson, Daryl and Kyle Pinto and Nicholas Pecho. 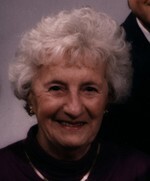 Margo immigrated to Cleveland from Hungary in 1956 and worked for Thompson, Hine & Flory until her retirement in 1984. Memorial Mass 12 NOON FRIDAY at St. Emeric Church 1860 W. 22nd St. Cleveland, 44113 where the family will receive friends 11-12 noon. Inurnment Holy Cross Cemetery. Contributions may be made to St. Emeric Church.